Photo: Garry L. Warne (center), Royal Children’s Hospital Melbourne, where New Zealand District Health Boards often send intersex children for “feminising” IGM surgery. – to be broadcasted live via treatybodywebcast.org! The Concluding Observations for New Zealand – hopefully with a severe reprimand for IGM practices – are due at the end the 73rd CRC Session (30 Sep 2016). During its 73rd Session the UN Committee on the Rights of the Child (CRC) will review New Zealand’s (+ South Africa’s) record of protecting its children from harmful practices (as stipulated in under art. 24(3) CRC in conjunction with the CRC-CEDAW Joint General Comment No. 18/31). 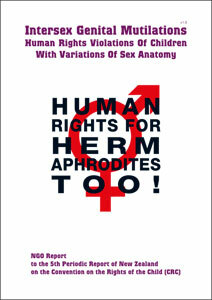 Above thematic Report to the Committee documents evidence of IGM still being perpetrated by major New Zealand public University Children’s Clinics and District Hospital Bords, plus intersex children sent abroad to Australia for involuntary treatments, and the complicity of the state in this ongoing massive human rights violation. CRC has so far investigated IGM practices in 6 countries, each time criticising IGM as a “harmful practice” (just like FGM) and issuing stern reprimands to the complicit governments. Let’s again hope for tough questions during the upcoming review of New Zealand – and for strong Concluding Observations for the New Zealand Government (+ South Africa) to take all necessary measures, including legislation, to finally end the impunity of IGM perpetrators and their accessories! Intersex body shaming is NOT OK – no matter who’s doing it!